– “Booking Confirmation” – Details of your activity and other associated services together with pricing and payment information. – “Itinerary” – Detailed information relating to your activity, and other related services and subsequently confirmed within the booking confirmation. – “Contract” – The agreed programme, as detailed within the booking confirmation. It is assumed that you are the lead contact for your group and that all correspondence or conversations will take place between you and us. These conditions shall form the basis of the agreement for your booking and shall apply to the exclusion of any other terms and conditions whether put forward by you, your group or a third party or whether implied by law. No alteration to these conditions shall be effective unless expressly agreed to in writing by a director of The Axe Effect. For the privacy & cookies policy please go here. All bookings are non-refundable. Full payment is due at the time of booking. Due to the nature of the business when bookings are confirmed The Axe Effact immediately incurs expenses and costs directly relating to your booking whilst we prepare for your arrival. All bookings are non-transferable, except at the complete discretion of The Axe Effect. Only in extenuating circumstances will bookings be considered for transfer and where at least a minimum of 48 hours notice of request is given via email. 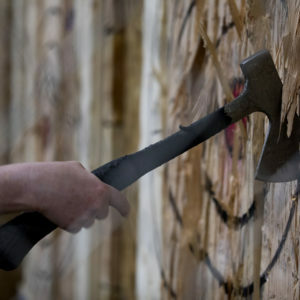 A minimum of 6 players is required for each session, except at the absolute discretion of The Axe Effect. Session times that are not filled by the minimum number of 6 players may be rescheduled. Players will be contacted to arrange an alternate date and/or time. 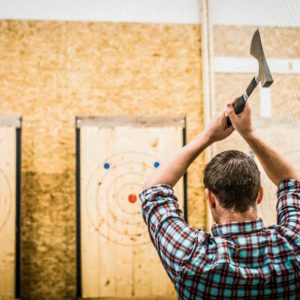 The Axe Effect reserves the right to move your booking time or day due to operational needs. We will use all reasonable endeavours to ensure that The Axe Effect operates. However, we reserve the right, in our absolute discretion, whether for safety reasons or otherwise, and with or without prior notice, to cancel any session. In the event of such cancellation, The Axe Effect will fully refund any visitor whose session is cancelled, the cost of his or her prepaid ticket, but otherwise shall have no liability whatsoever, including liability for travel expenses or any other out of pocket expenses, in respect of the cancellation. 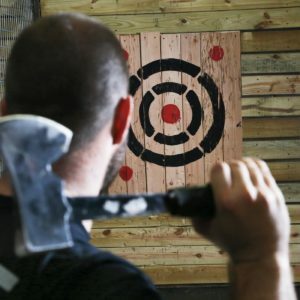 All players should arrive at their booked “The Axe Effect” axe throwing venue no less than 15 minutes prior to the playing time. Please be aware if you miss your scheduled start time you will not be eligible for a later booking or refund. If you are not present upon check-in for your pre-booked time our team will endeavour to contact you, please ensure you provide us with a mobile telephone number that your group leader will have with them on the booking day. The Axe Effect will prioritise all customers against their booking times and never allow late running customers to have an impact on later start times. The Axe Effect is not responsible for factors out of its control, for example; late running commuter services, traffic or parking difficulties (this is not an exhaustive list). Please note that players must be aged 18 years or older. We reserve the right to disallow players who do not meet these requirements, without refund. We reserve the right to disallow play on the day of your event without refund if you or any of your party are deemed by our staff to be physically unfit to play due to injury, illness, pregnancy or other condition. Please contact us in advance if you have any concerns about the health or fitness of any member of the group. If we think you look under 25 you might be asked for valid ID to prove your age. We reserve the right to disallow play on the day of your event with no refund if you or any of your party are believed to be under the influence of alcohol or drugs. We reserve the right to halt play and terminate your event with no refund if you or any of your party do not follow instructions from The Axe Effect staff. We require immediate full payment to confirm all bookings. This payment is non-refundable if you are unable to attend the date confirmed. After a booking has been made The Axe Effect will send a booking confirmation with details of the payment made and also details of the package including dates, number of participants and any other details relevant to the booking. It is the client’s responsibility to check that the details on the confirmation are correct and they must advise The Axe Effect of any inaccuracies within 24 hours of making the booking. By credit card or by debit card, Paypal, Sofort, Ideal and many more. Payments can be made in whole by the group leader or attendees. Refunds to the group leader or attendees may not exceed the total amount that they have paid. If full payment is not received by the date specified by us, then we reserve the right to cancel your reservation and cancellation charges will apply as detailed below. The time, date and location of your booking cannot be altered, however if you require an alteration, please contact The Axe Effect and we will do our best to accommodate you. Once a booking has been made amendments can only be made with prior agreement from us. All bookings are non-transferrable and non-refundable. We reserve the right to cancel your booking with full refund in the unlikely event that we are unable to complete your booking. In the unlikely event that our venues terms and/or availability for your group changes after you have made a booking, we will do our utmost to ensure you experience as little disruption as possible. We offer goods and services on behalf of our venues and services and do so in good faith. If we are unable to make alternative arrangement in the case of a venue or service cancellation then we will offer an alternative or a refund for that part of your booking. In any event, we shall not be liable for any delays or any failure to perform any of our obligations under these conditions, or any third party obligations, caused by any factor beyond our reasonable control, including but not limited to acts of terrorism, natural disasters, poor weather conditions and the declaration of war. All prices quoted by us are based upon costs current as at the booking date. If you have made your booking within 6 weeks of your event then we will do our best to ensure that there are no price changes although this cannot be guaranteed and we reserve the right to demand payment for any additional charges owing to the nature of the late booking. UNLESS, if you notify us of change in the number of people in your group then we unequivocally reserve the right to change the price of your event at any time to reflect extra costs incurred in transfers, group booking costs, administration etc. By giving us your name and personal details you consent for these to be used as necessary in processing your booking and complying with legal requirements. This may also include providing your contact telephone number to suppliers connected with your booking so that they are able to reach you in the event of an emergency. We may also use your details to send you details of special offers from ourselves or other carefully selected companies – should you not want to receive these, please tell us. Your personal details will not be passed on to any other third parties. By making a booking with The Axe Effect you agree that all images and video taken of you and your group by us at our events is the exclusive property of The Axe Effect and may be used for promotional activities online and in print. If you do not wish The Axe Effect to use these images and video, please notify us before the day of your event. The Material may contain inaccuracies or typographical errors. We make no representations about the accuracy, reliability, completeness or timeliness of the Material or about the results to be obtained from using our Websites and the Material. We do not guarantee that the Websites will operate error-free or that this Website and its server are free of computer viruses and other harmful material. If your use of the Website or the Material results in the need for servicing or replacing equipment or data, we accept no responsibility for those costs. Our Website may contain links to third party websites. These links are provided as a convenience to you and not as an endorsement by us of the contents on such third party websites. We are not responsible for the content of linked third party sites and do not make any representations regarding the content or accuracy of materials on such third party websites. Accessing linked third party websites is done at your own risk. We may use the information we obtain relating to you, including your name, mailing address and e-mail address for our internal business and marketing purposes. We do not regard submission of an enquiry form as confirmation of booking. You should first receive from us a confirmation email and booking reference number to ensure that your requirements can be met and to check availability. Whilst provisional bookings can be made over the telephone, full confirmation of your booking must be made via the online booking service on our website. Upon receipt of this you will receive a booking reference number. In making a booking with us acceptance of our booking terms and conditions is understood and in the case of group bookings, that the person making the booking is responsible for making all members of his or her group aware of these conditions. Provided that nothing in this condition shall operate so as to exclude our non-excludable liability in respect of death or personal injury caused by our negligence, or to affect your statutory rights as a consumer, or to exclude liability for fraudulent misrepresentation: we shall not be liable to you or your group in contract, tort (including without limitation negligence) and/or breach of statutory duty for any loss or damage which you or your group may suffer by reason of any act, omission, neglect or default (including negligence) in the performance of these conditions by us our servants or agents, in a sum which is greater than the price of The Axe Effect event and we shall not be liable to you or your group in contract, tort (including without limitation negligence) and/or breach of statutory duty for any loss of profits and/or less of production or any indirect or consequential (including economic) loss of any kind which you, your group, or any member of your group (including negligence) in the performance of these conditions by us our servants or agents. You and your group must undertake to comply with all instructions relating to The Axe Effect event received from us or any of our venues or services from time to time and to take such other steps sufficient to ensure, so far as is reasonably practicable, that The Axe Effect event will at all times be safe and without risk to health. As a result, you will be asked to sign disclaimer forms prior to commencement of your activity. You are expected to respect your environment and other people around you throughout the duration of your Axe Effect event. All venues and/or services have every right to terminate, without notice, your activity under threat of vandalism, violence or any other behaviour deemed inappropriate by them. In such cases all insurances will be invalidated and you will not have any entitlement to a refund of any kind whatsoever. We accept no liability for any accident or misadventure that occurs while any of your group is under the influence of drinks or drugs. We accept no liability for any damage caused by any member of your group and will provide your contact details to any venue or service seeking to claim compensation as a result of the actions of your party. Should a customer wish to lodge a complaint, they must submit the complaint in writing to The Axe Effect management. In all instances where the complaint relates to a third party venue and/or service, the customer must first raise the issue directly with the venue and/or service, to provide them with a chance to rectify the situation. These terms and conditions are in place to ensure the smooth running and enjoyment of your event. They are governed by Dutch Law and shall be subject to the exclusive jurisdiction of the Dutch Courts. These conditions are personal to you and your group. You or your group shall not assign, transfer or charge your rights and responsibilities under these conditions or any of them, without our prior written consent. For the avoidance of doubt nothing in these conditions shall confer on any third party any benefit or the right to enforce any provision of these conditions.